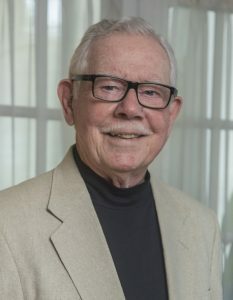 On November 12, 2012, at age 84, Dr. Jack McNulty launched the Palliative Rural Education Project with a two-day program in north Mississippi. Since then, he’s brought the project to healthcare providers in 32 communities across two states. It is a shining highlight of Jack’s third career. He was a pharmacist by age 18, then a physician, and now, since age 72, a relentless advocate for improving the quality of life of people suffering from the pain and stress of serious illness. Jack grew up during the Great Depression. His father was a pharmacist, and the family lived above the pharmacy. Jack recalls how his father would answer the door at any hour. It was an important lesson: no matter what time of day or night, if someone comes to you for help, you give it. Even if they can’t pay, you help them. That lesson launched seven decades of service to others. Over the years, Jack witnessed the advancement of lifesaving medicine and the acceleration of technology. As care got more and more specialized, he saw a growing need for another specialty: one that focuses not on a condition, but on the person – their pain, their comfort and their quality of life. In 2002, when Jack founded the Palliative Care Institute of Southeast La., the field of palliative care was in its infancy. Few people knew of it. Few people … until Jack got involved. Jack is passionate about palliative care. But passion doesn’t open doors or start programs. It takes the respect and the network of relationships that can only be built over a lifetime. Jack’s passion drives him to keep going, to reach farther, to talk to a broader audience. That in mind, this year, he published a series of eight video lectures online. He’s doing some of the most important work he’s ever done. He is helping people get the most out of their lives. Jack McNulty … Peoples Health Champion.